Under Review - This lore is not technically yet official. Don't take it entirely as canon. Earth is the birthplace of mankind and remains the true heart of economic, cultural, and political influence - the pearl of both the Sol system and umanity as a whole. 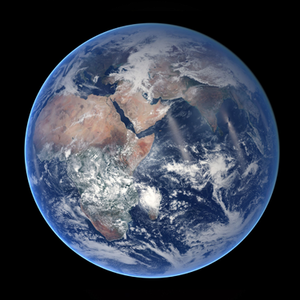 Earth is a terrestrial planet, of which the majority of the surface is seas and oceans. The remainder is composed of several large continents and many islands. Human population has over the years gravitated towards larger settlements, creating vast metropolises as larger cities merge together. The prevalence of rural communities has diminished even more since the early 22th century, with population density still increasing since then. A conscious effort by governments, non-profit organizations, and the private sector means that deserted land and former industrial regions have in places been somewhat restored or reclaimed by nature, often as managed forestry industry, leisure areas, or wildlife preserves. Public transport within cities is used regularly and extensively, and while personal vehicles are less common, they still provide freedom from transport schedules. Earth's population hosts a number of aliens, owing to its economic and cultural importance. There are comparably few positronics on Earth as compared to even the rest of the Sol system-- by the time of the creation of the positronic brain, Earth's labor pool was incredibly stable and had no need for synthetic labor. Around eight billion people live on Earth, with a large number of retirees and high-ranking politicians (as well as the middle and lower classes that work in Earth's service industry). Enough shuttles leave Earth daily to easily match Earth's fairly low reproductive rate, leaving the population count stagnant. Earth's primary industries are service and entertainment. The vast majority of high-budget films, video, and VR simulations are produced in Earth's metropoli, as is an appreciable amount of advertising. The high-paid executives and actors buoy an astonishing number of masseuses, chefs, prostitutes, private drivers, and other personal service workers (encouraged by the high top-bracket stored wealth tax rates of many Earth nations). Mining, agriculture, and manufacturing have been largely outsourced to Earth's siblings in the Inner System. There remains, however, a luxury market for Earth-grown "traditional" agricultural products, especially tobacco and coffee beans (famously employed by Gilthari Exports in the creations of several high-class consumables). These farms employ a surprising amount of menial labor, often seasonal, and bolster Earth's export economy. Tourism is the third pillar of the Terran economy. Earth is an important cultural and historic site for nearly every human group, and important landmarks from the 21st century have been meticulously maintained for the absolutely massive daily influx of tourists, some from as far away as Eutopia, who have come to see the sights. Curious aliens also make up an appreciable number of tourists, with shuttles full of Skrell disembarking every few minutes at spaceports across the planet to tour in protected, culturally isolated groups. The most popular tourist sites are New York, Paris, Baghdad, and Cairo, although just about every surviving city has some level of tourism. Outdated - The lore here may be partially or wholly outdated. Do not rely on it. Earth is still divided into a variety of states that are, on the interstellar scale, quite small. They're almost all democratic republics with varying levels of corruption and autocracy, but most are recognized as SolGov member states, giving Earth an enormous number of votes in the Colonial Assembly. While borders in Europe, Oceania, Africa, and the Americas are much as they were in the 21st century and for the most part all 21st century nations still exist, they are generally divided into six sphere of influence of the "Big Six" superpowers: The United States, The European Union, Russia, Brazil, South Africa, and China. The 21st century's infighting in the Middle East calmed and resulted in a semi-stable coalition of minor states sometimes called a seventh superpower, while China was reduced drastically in size by a series of revolutions and is now an indirect hedgemon of several new states. Notable locations are constant from the 21st century with a very few exceptions (mostly seabed and Antartic colonies). Baghdad was destroyed in the summer of 2092 by a self-replicating nanotechnology strain called the Gray Tide. While mostly rebuilt as a hypermodern arcology, portions of the devastated area remain preserved, and "pilgrimages" to Baghdad by Icarus Front loyalists and officials are common. The blighted areas themselves are mostly heaps upon heaps of plastic, wood, and bone-- the only substances not consumed by the Gray Tide. The first site of permanent human habitation in Antarctica, and a pioneer of various arcology designs and technologies, Paradise Bay has weathered the regrowth of the ice caps fairly badly. Never a particularly sterling example of engineering, Paradise Bay is now in a constant state of disrepair and is one of the poorest and most economically-exploited regions on Earth. A series of undersea geodesic domes off the east coast of Japan, Atlantis has some of the highest property values in existance. It is a glittering undersea city of excess, and one of the most sought-after tourist destinations of all time. A SolGov-owned settlement off the coast of what was Curacao, Elevator City's purpose is maintaining Earth's historic first space elevator and managing the huge flow of cargo and passengers that enter and leave the city on a daily basis. The interior of the city, the closest to the elevator itself, consists of high-rise office buildings and vacation homes for off-world businessmen, while the outskirts are low-cost housing for a mix of refugees and hitchhikers. The history of Earth after the 21st century is marked with a steady worsening of environmental conditions, leading to a global effort to colonize Luna and Mars, as well as to re-terraform Earth itself. This colonization scramble is sometimes called the Second Space Race, although it bears more resemblance to the early Age of Exploration than to the US-Soviet Space Race. Environmental conditions contributed to civil unrest in many major nations, exacerbated by high-profile technological disasters leading to widespread public mistrust of the scientific authority. This unrest was co-opted by the Icarus Front, who would spearhead the formation of SolGov and the further colonization of the Inner System worlds. Widespread flooding ruined several coastal regions, including California and the Netherlands, but Earth was eventually re-terraformed with the help of extraterrestrial and extrasolar colonies. The refugee crisis spurred by these natural disasters contributed to the growth of the Martian and other colonial populations, and lead to the present Terran class structure. This page was last edited on 5 September 2018, at 16:52.